As the pioneer of the tapeless workflow in the world of media and information migration, we saw a growing and compelling need on the horizon. Many industries, including digital imaging, were capturing and storing data to external [SATA] hard drives, but we couldn’t identify an effective and cost effective storage solution and drives were stacking up! 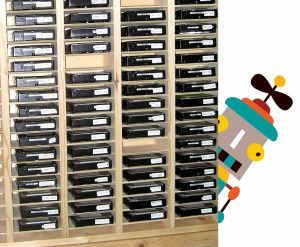 Our solution: a series of hand-crafted hard drive shelves for organizing and protecting multiple external hard drives and XDCAM discs. Capacity ranges from 6 hard drives to 360. Popular hard drive modular shelf unit.